Reiki is an Ancient healing tradition from Asia. During a treatment the healing energies of Reiki bring balance, comfort and peace to body, mind and spirit. Through the practitioner's hands the Universal Life Force (also called "Chi" or "Ki") gently penetrates the body of the recipient right down to the cellular level. It intelligently goes to the place in the body where it is most needed. Clients may experience sensations of heat, a soft tingling or sometimes even cold, according to their individual need to balance their system. Reiki gently dissolves the tension held in the tissue of any given symptom and helps to release the anxieties related to the "dis-ease." During a treatment Gigi receives intuitive messages which become part of the healing process. Eventually body, mind and spirit are refreshed, harmonized and healed. Reiki is helpful for relieving stress, chronic symptoms, headaches, backaches and any kind of pain. It facilitates recovery from surgery. Reiki healing does not interfere with conventional Western medicine, it works along with it. During a treatment the client relaxes on a massage table and remains fully clothed. One 60 minute session is $60.00 call or email Gigi. "Every healing is a re-distribution of energy"
Reiki (pronounced Ray-key) means spiritually guided Life Force Energy. It is a Japanese healing art which uses gentle touch to increase the flow of Ki (Universal life energy or chi) which flows within and around us. Enhancing this energy balances the body, helping to increase a sense of well-being and assisting the body's natural ability to heal and self-regulate. Reiki is a simple laying-on of hands on or over a series of body locations. It can have a profound effect in relieving stress, reducing pain and promoting healing. All levels are being affected – physical, mental, emotional and spiritual. In Level One you will learn the history of Reiki, what it is and how it works, information about the human energy system (chakras), and various hand positions for healing yourself and others. You will be given your first attunement, which transfers Reiki from the master to the new practitioner, and will experience giving and receiving a treatment. Reiki Level One is whole and complete. 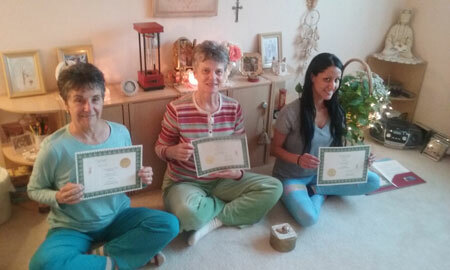 You are fully certified to do Reiki on yourself, on others, on animals and plants. This energy is available to you for the rest of your life. It is instantly available because all you need is your hands. It is a first aid kit in your hands. 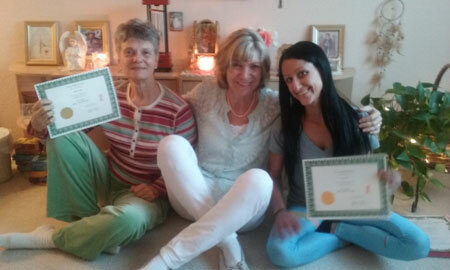 A Reiki seminar is most valuable when you bring to it a specific intention or goal. You might have a physical or emotional condition which you would like to alleviate through self-healing with Reiki. You may want to assist particular loved ones and friends through Reiki healing. Gigi prefers to teach Reiki at her home in Mission Viejo, CA., in the intimate setting of her meditation room with three students per class. This way she can guide the students individually through the session and discuss their questions. Gigi's seminar – usually on a Sunday - starts at 10:00 AM and ends about 5:00 PM with one hour lunch break. Gigi has been practicing Reiki since 1996. She also teaches Reiki Level Two and the Master Class. Fee: $150.00, includes Reiki level ONE attunement, detailed instructive reference packet, Certificate of Completion. Please call or email Gigi if you would like to become a Reiki Level One practitioner.